at (408) 867-1901 for more information or to express your interest. 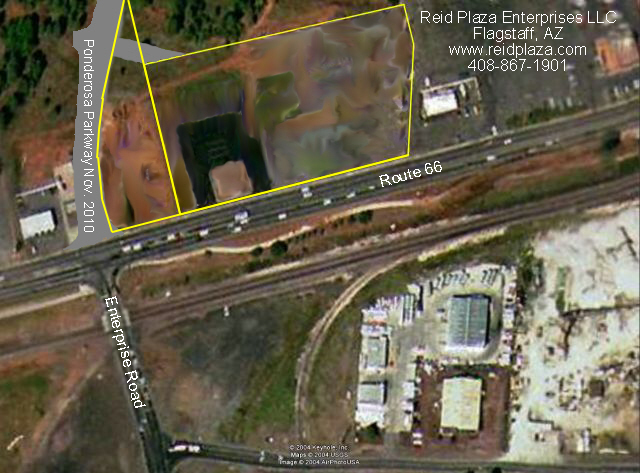 The property is mostly level, and can accommodate up to 50,000 square feet of leasable commercial space. Its location of high traffic (generally over 30,000 cars a day on Route 66 alone) and visibility is best suited for restaurant and retail usage. It is located on Route 66 (a main commute road) at Enterprise Road, between Flagstaff and East Flagstaff. Easy access from Interstate 40 draws customers from cross-country Interstate traffic, as well as from Sedona and the Verde Valley (since Flagstaff is closer than Phoenix). Development of a Catholic church (completed) and school nearby included extending Enterprise Road across Route 66. The site now hosts a Starbucks and a car wash, with a restaurant under construction. The final parcel is sale pending. The development team includes owner Laurie Nemec and consultants. Number 4 in top Places to Raise Outdoors-Loving Kids in Aug 2009 Backpacker magazine. Number 9 in best city (to live and work) in July 2009 Kiplinger's Personal Finance Magazine. See the July 2009 issue of Arizona Highways Magazine, which featured Flagstaff: lodging, dining, recreation, and a lot more. Seventh out of 118 mid-sized cities in the Milken Institute's 2004 Index of Best Performing Cities. One of Expansion Management magazine's 50 "Hottest Cities for Expansions and Relocations", February 2007. Average household income is $50,000. 64% of the workforce is white collar. Demographic and other information is available from the Flagstaff Chamber of Commerce and from Flagstaff Planning. Traffic volume information is available from Flagstaff Traffic Engineering. The property boundary is outlined on the photo below, modified to show the land as it now stands, empty, ready for development. 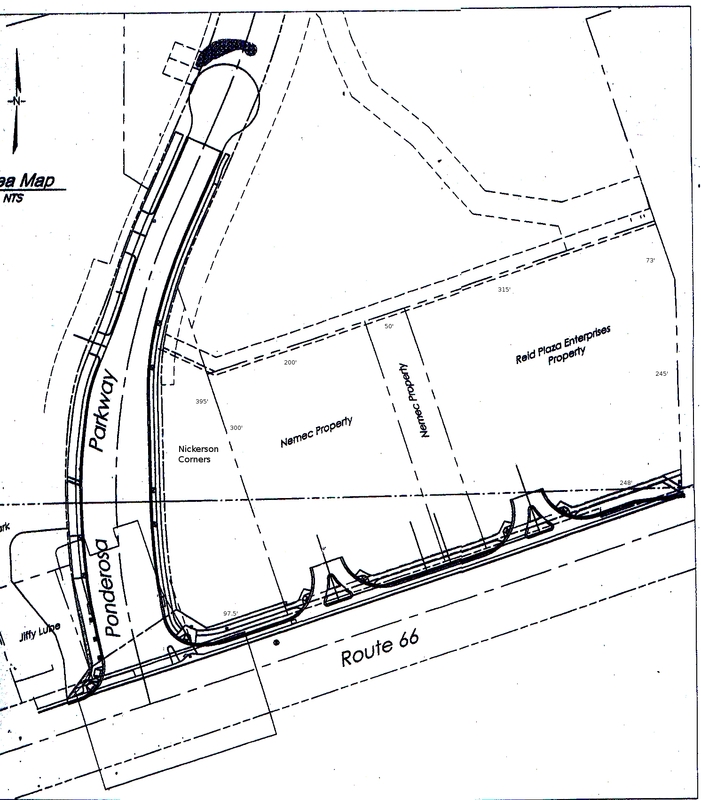 This plot map is a construction drawing for the Ponderosa Parkway intersection improvements. The two driveways from Route 66 are complete. 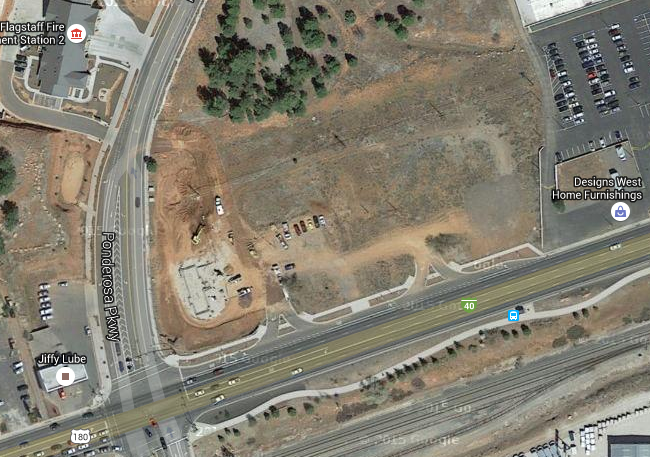 The two driveways from Ponderosa Parkway are only curb cuts now.